Staying in contact with loved ones is essential for those behind bars to keep hope alive and get back on their feet when they regain their freedom. 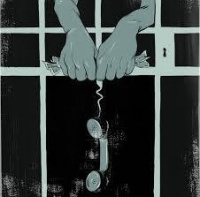 Those incarcerated in an Illinois prison pay approximately $4.00 whether it is for a one or a 30 minute phone call. Families can pay hundreds of dollars each month for phone calls from prison. The private contracter Securus gives 76% of the money they collect to the Illinois Department of Corrections―making Illinois among the states with the highest percentage of “kickbacks” in the country. These kickbacks amount to more than $12 million a year. Why are these calls so expensive? Because phone companies make deals with the state or county to provide expensive, exclusive phone service. In return, the phone companies give kickbacks to the government. Who pays? These collect calls are primarily paid for by families who have a loved one incarcerated―most of whom are poor. Phone calls are the main method people in prison have of maintaining contact with loved ones on the outside. Research has shown that people who maintain contact with family members, especially their children, have a much better chance of succeeding when they are released. Excessive charges for phone calls contribute to the breakup of families and make all the more likely that people who are released will end up back in prison. The new trend is video visitations which can be a benefit to families who have to travel long distances to visit a loved one who is incarcerated, but also raise concerns. We have found counties in Illinois where they charge an exorbitant $40 for a 40 minute session. Additionally, some contracts for video services require elimination of all face-to-face visitations, which can have a dehumanizing effect. The Illinois Prison Phone Justice Campaign is pushing for the elimination of all kickbacks to the Illinois Department of Corrections. This has been done in eight other states. In New York people pay less than five cents a minute for a phone call. In New Mexico, prisoners pay 66 cents for a 15 minute call. Why should it be different in Illinois? We want to see the regulation of phone and video visits setting reasonable and affordable rates for families. We support the Bill of Rights for Children of Incarceration Parents giving children the right to speak with, see, and touch their parents who are incarcerated.